Today’s recipe is a strawberry milkshake! This might not be an ancient, traditional Korean recipe, but in Korea this is how me and my friends always made milkshakes. Only later did I realize that Americans made milkshakes much differently. The secret to this milkshake is to freeze the strawberries beforehand, so when you blend them with honey and milk, the shake will be icy, smooth, and sweet, like a cross between a milkshake and a slush. You don’t need to use any ice cream, it’ll still be cold, smooth, and creamy this way. I’ve never met anyone who didn’t like my strawberry milkshake, especially when made with strawberries that are in season. When I lived in Korea, I used to go to the wholesale farmers’ market with my friends when strawberries were in season, and we’d buy huge wooden boxes of strawberries. We sometimes would split them amongst ourselves in the parking lot. This way we could get the best quality strawberries of the year, at the cheapest price. I’d take them home and hull and clean strawberries all afternoon. It was hard work but I was excited because after that day I could make strawberry milkshakes for my family for months and months. I’d also make jam with them, and my own strawberry liquor. Strawberry season is here again! Go and get some, enjoy this recipe, and freeze some for the future! Let me know how your family love your strawberry milkshake! Cut the strawberries into small pieces and put them in a bowl. Add 2 tablespoons sugar and mix well. Divide them into 2 and put each portion into a plastic bag. Each bag will be about ½ pound and it will serve 1 or 2 people. Freeze the bags until the strawberries get hard like ice cubes. Now time to make strawberry milkshake! Take out 1 bag of frozen strawberry from the freezer. Let it sit on the kitchen table for 1 or 2 minutes, then break up the block of icy strawberries. Split each strawberry chunk by hand in the plastic bag. Place the strawberries into a blender. Add 1½ cups of cold milk and 2 tablespoons of honey. Blend it for about 30 seconds, until the strawberries are crushed and well mixed with the milk. Pour into a chilled glass and serve right away, while it’s still slushy. Posted on Friday, May 10th, 2013 at 11:16 am. Last updated on April 26, 2015. Posted January 30th, 2018 at 4:24 pm | Log in to reply. I love ice cream — strawberry and vanilla — but to be honest with you, I’ve never had a milkshake before. I know — crazy, right? Hehe. At first, I didn’t want to try a milkshake because of the seeds from the strawberries, but yours looks absolutely delicious! I would love to try it someday. By the way, I’ve been meaning to ask you: where on earth do you buy those plastic bags? I’ve been searching everywhere for that specific kind, and I’ve come up empty. Do you buy them from Wal-Mart, Publix, Winn Dixie…? Please tell me, I have to know! Thank you in advance. Posted August 1st, 2017 at 11:46 am | Log in to reply. Posted August 7th, 2017 at 11:40 am | Log in to reply. 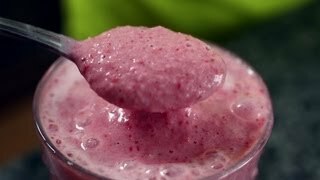 My recipe motivated for you to get a blender! I’m sure you will use it often. Happy cooking! Posted May 18th, 2014 at 10:34 am | Log in to reply. Posted July 10th, 2013 at 12:03 pm | Log in to reply. Any chance someone can tell me how much to use for just one person? I’d like to make this in the morning when I wake up. Posted June 3rd, 2013 at 12:50 pm | Log in to reply. Posted May 30th, 2013 at 10:13 pm | Log in to reply. Also, I’ve visited your site but never commented, so here I am! Posted May 31st, 2013 at 1:07 am | Log in to reply. Just made it with blueberries as well. So delicious. Posted May 31st, 2013 at 6:11 am | Log in to reply. Posted May 20th, 2013 at 1:25 pm | Log in to reply. Wow…the frozen strawberries are an awesome twist to the traditional way. But wouldn’t this be more like a smoothie than a milkshake (since milkshake uses ice cream)? I love strawberries. I just missed the Strawberry Festival in Oxnard. I’m kind of sad. But, there’s always next year lol. Strawberries are one of my fav fruits, so I’m excited about strawberry season. I love strawberry flavored desserts. Posted May 20th, 2013 at 10:41 am | Log in to reply. Posted May 13th, 2013 at 12:38 pm | Log in to reply. Posted May 14th, 2013 at 9:49 am | Log in to reply. Thank you, Jerry! Happy cooking! This recipe was originally posted on May 10, 2013 at 11:16 am by Maangchi. It was last updated on April 26, 2015. The video was watched 994,193 times on YouTube & has 10,200 likes!